On the left you see the left middle leg of a Corixa species (possibly punctata), we are looking at the head side. On top left a little part of the front leg can be seen. The middle legs are long and have a few pegs and hairs. The hairs might help in using the middle legs as a kind of rudder. In order to lower the friction the hairs are logically placed on the back part of the legs. 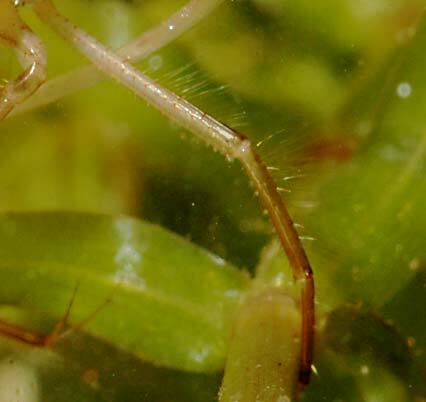 Anchoring is the main function of the middle legs, on this picture the claws of the left leg are hooked like an anchor under the stem of a twig of water pest. The claws are relatively large, those of the right middle leg are visible at the bottom left. The middle leg may also be used as a brush for cleaning the body. Finally on the left a drawing of a Lesser Water Boatman sitting on the bottom, seen from behind. The stature of the three leg pairs is shown here. Next page: the hind legs.